high solubility soluble soybean polysaccharide soluble in cold water, hot water, can be prepared more than 10% of the aqueous solution, and will not gel phenomenon. As stabilizers for acidic drinks, can stabilize particulates, while ensuring very low viscosity. soluble soybean polysaccharide solution viscosity of heat, acid, salt has little effect, with high stability. with higher dietary fiber determined by the HPLC method, soy polysaccharide dietary fiber content of more than 70%, therefore the ideal supplement dietary fiber raw materials. capacity, cohesion and precipitation of protein molecules easily and affect the stability of the system, if by adding a thickener to seek stable, will increase the viscosity, affect the final product quality and taste. 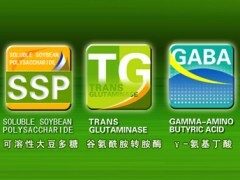 Soybean soluble polysaccharide with both stable proteins can function without increasing the viscosity. In the acidic environment, the soluble soybean polysaccharide protein molecules can prevent condensation and precipitation, due to the low viscosity of soybean dietary fiber, so adding the product does not increase the viscosity. Soybean soluble polysaccharide using this feature, you can make good quality, fresh taste and good stability yogurt products. stabilizers can be used for transparent packaging cocoa, tea, coffee, calcium-fortified milk, acidic protein drinks, fruit juices and fruit drinks as a suspension stabilizer suspension, suspension stability, can effectively inhibit the oil ring or layered formation, low viscosity, fresh and delicious, ideal for ultra-high temperature sterilization process.